Are you operating as a mortgage broker or lender in Georgia? Then you must be in compliance with the new Georgia mortgage broker bond requirements. House Bill 143 introduced higher bond amounts for mortgage brokers and lenders in the state. 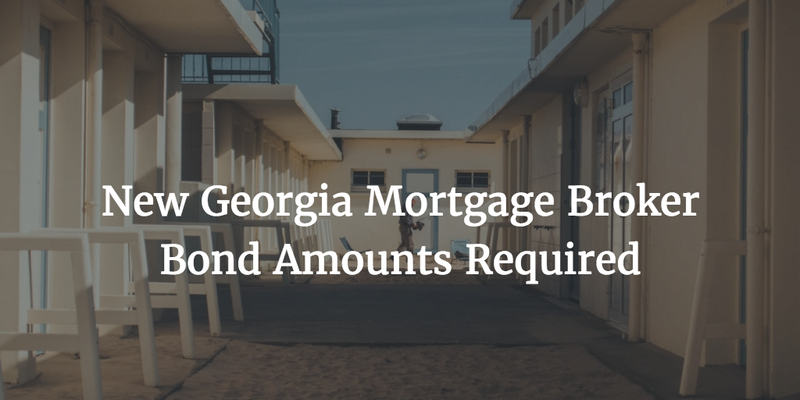 As of June 1, 2017, brokers in Georgia have to post a mortgage broker bond with a minimum amount of $150,000. Mortgage lenders need to meet a new requirement of a minimum $250,000 bond. Start your mortgage broker bond application. 100% money-back guarantee! Here are the main changes for mortgage professionals brought by the new legislation in Georgia. Mortgage brokers and lenders have to get licensed with the Georgia Department of Banking and Finance, so that they are allowed to work legally in the state. Obtaining a surety bond is one of the main requirements you have to meet. With the new bill, the bond amount for mortgage brokers increases from a minimum of $50,000 to $150,000. If you work as a mortgage lender, the new minimum bond amount is $250,000, being $150,000 previously. For both type of mortgage professionals, the Department can assign a higher bond requirement if needed. The increased bond amounts may affect your surety bond cost, but you can still work on controlling the price you pay. As your bond premium depends on factors such as your credit score and the strength of your finances, if you work on improving them, you can still pay less for getting bonded. Thus, for a $150,000 mortgage broker bond, you can pay as little as 1%-3% of the bond amount, or $1,500-$4,500. Besides the bond amount increase, there is another change in the new legislation that Georgia mortgage brokers and lenders have to note. It introduces an easier process for cancelling pre-existing surety bonds that correspond to previous legislation. As all mortgage professionals, you are undergoing the licensing procedure through the Nationwide Multistate Licensing System & Registry (NMLS). According to the new bill, you can cancel your old bond directly in the NMLS system. This means you don’t need to turn to the party that issued the bond, but you can deactivate it online in the NMLS website. How do you see the bond amount increase for Georgia mortgage brokers and lenders? Please share your thoughts in the comments.